Palaeontology (taxonomy and evolution of hipparions, cave bears, late cretaceous vertebrates), palaeoecology, biochronology, taphonomy, stratigraphy. 2003—2007 — Joined research project between NMNHS-BAS and CNRS. 2008—2012 — Search for the Earliest Human Prehistory: Paleontological Investigations in the Locality of the Last Prehuman Hominoids in Europe (Azmaka near Chirpan, Bulgaria, Turolian). Granted by the Bulgarian Academy of Sciences. Additional grants by L.S.B. Leakey Foundation, the Fyssen Foundation and the University of Tübingen. 2009—2011 — Climate dynamics and the extinction of great apes during the late Miocene in Europe 2009—2011. Supported by the Fyssen Foundation (Principal Investigator: Gildas MERCERON, Univ. of Lyon1). 2013 — NMNHS project Exhibition Making. Part of the project ‘Creation and popularising of cultural-historical product at Rakitovo municipality, via adaptation of the Palaeontological locality Dorkovo as a touristic attraction and socialising the cultural monument Tsepina fortress’. 2014—2016 — Palaeoenvironment, climate impacts, human dispersal and adaptations during the Pleistocene and Early Holocene in the Balkans. FWO-BAS. 2014—2017 — The mystery of the arranged cave bear skulls: Excavations and research in Mishin kamik cave. Granted by United Bulgarian Bank. 2015—2017 — Creation and maintenance of Palaeobotanical collection at the National Museum of Natural History, Sofia, Bulgarian Academy of Sciences. 2016—2018 — The Thracians — genesis and development of the ethnicity, cultural identity, civilizational interactions and ancient heritage. Sub-subject 3: The natural environment at the ancient times and origin of the domestication and stock-breeding on the Bulgarian territory and Europe. 2012 and continues — ‘In search of the latest pre-human hominides in Europe and studying their environment’. Granted by United Bulgarian Bank. 2017 and continues — Joined Bulgarian — Macedonian palaeontological excavations near Dolni Disan Village, Negotino vicinity. Partially granted by Bulgarian Academy of Sciences. 2017—2019 — ‘Comparison of the Neogene fossil mammals from China and Bulgaria’, International Partnership Program of Chinese Academy of Sciences (Grant No. GJHZ1885). 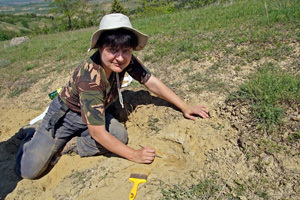 April 2018—April 2019 — Palaeontological excavations and investigations in search of the Bulgarian dinosaurs. Project of the National Museum of National History; granted by United Bulgarian Bank. Gurova, M., Ivanova, S., Marinova, E., V., Spassov, N., Hristova, L., Verheyden, S., Burlet, C., 2018. Excavations at Mishin Kamik Cave: fifth season. — Archaeological Discoveries and Excavations in 2017, National Archaeological Institute with Museum at the Bulgarian Academy of Sciences,8—11. Gurova, M., Ivanova, S., Spassov, N., Hristova, L., Popov, V., Marinova, E., Böhme, M., 2017. Excavations at Mishin Kamik Cave: fourth season. 2016 season. — Archaeological Discoveries and Excavations in 2016, National Archaeological Institute with Museum at the Bulgarian Academy of Sciences, 48—50.